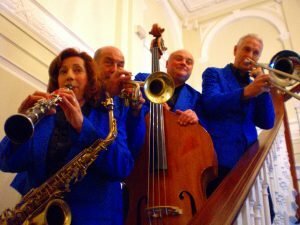 For themed events the band’s music and attire can accommodate 1940’s military uniform / Glenn Miller U.S. Army Air Force, James Bond / White Tuxedo, Sinatra, Gatsby, Las Vegas and Jazz Theme. 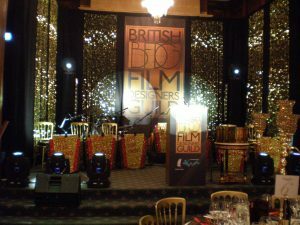 Previous clients:- Volvo, Nisan, Kodak, Bank of England, City Financial Firms, British Airways, Granada TV, GlaxoSmithKline, BP, West-End Private Members Clubs, Elstree Film Studios and many more.. 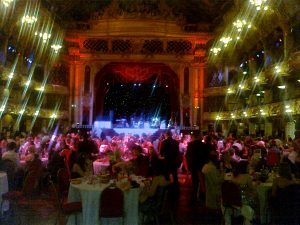 The requirement of clients such as these demands great attention to detail, as provided by Five Star Swing. 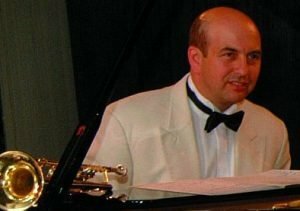 Your event’s etiquette is assured by Chris Smith’s 40 year experience and oversight of seasoned professional musicians with an eye on providing the right atmosphere at the right time – from subtle background music to lively music for a full dancefloor. An even livelier set of 1960’s / Motown / Blues Brothers dance music is also available!